Going, Going, Gone by Nicholas O. 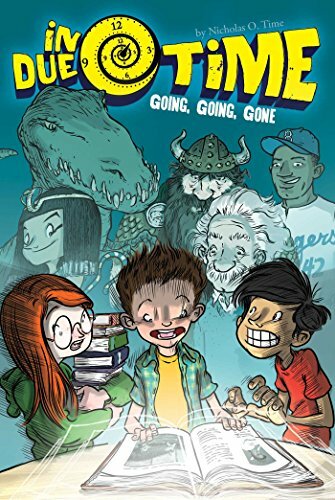 Time is about a group of middle school friends named Matt, Luis, and Grace who have a very mysterious library teacher named Valerie Tremt. She gives them a book called The Book Of Mysteries, which seems like a normal book, but it's just blank pages. The kids figure out that it is a time traveling book. Put in the time and place and...you're there. They all go back to 1951 to help Matt's grandpa become a major league player, but they only have 3 hours to do it. Can Matt and the team make his grandpa's dream come true and get back in time so they don't get stuck in the past? In my opinion, Going, Going, Gone was a good book. One thing I liked about it was that it had a lot of unexpected twists and turns. It also has a good plot and a great introduction of characters. My favorite character was Luis because he was a bit of a rebel, but he was also spontaneous and fun. The author also did a good job having the events of the past line up with the future after the group changed them. The only thing I didn't like about this book was the ending was dragged out a bit. But overall, I would recommend this book to others.